← It’s the TREND, dumbass! What exactly is the difference between climate change and global warming? Don’t hate, I’m new at this. The first few answers (listed above) didn’t seem very helpful. Not to worry, David. I’m here for you. Scientifically, it’s a different matter. The overall subject is climate change: the climate is changing, the reason is us. But there’s a lot to climate. There’s temperature, and humidity, and precipitation, and windiness and storminess and cloudiness and barometric pressure … boy there’s a lot to climate. Temperature is an important part of it, but it’s only one among many. When we study how human activity (mainly: greenhouse gases) affects climate, we find that temperature should be the first climate variable to respond noticeably. We knew this well before the temperature increase was observed. Now, it’s observed. Scientifically, that’s one of the things that sets global warming apart from climate change. The latter is about how all aspects of climate are changing, the former is all about the temperature. Yes, it fluctuates from year to year. It looks like it’ll never stop fluctuating. 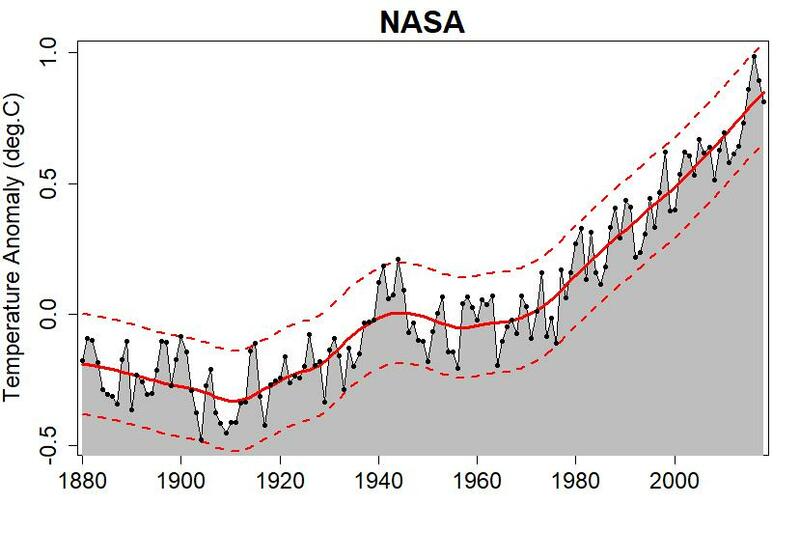 That line is an estimate of the trend, and since it’s changing over time, we have temperature change. In fact it’s going up, and if we test it mathetmatically we find that it’s not just a false appearance, it doesn’t just “look like” it’s going up by lucky (or unlucky) accident, it’s a real trend and it’s really changing and it’s really going up. That’s the magic “warming” everybody’s talking about. Since it’s happening to the whole-world average, it’s the “global” everybody’s talking about. So, David, there you have it. GLOBAL WARMING is an upward (not downward) trend (not fluctuation) in global (not local) temperature. Climate change is any meaningful (i.e. not just fluctuations) change of any climate/weather variable. If you comprehend just that much, then you know a lot more than some people do. If you have further questions just ask. That was published in August, 1975, in “Science”. Could we class ocean warming under climate change too? It’s not ‘climate’ for us, but it’s the environment for a lot of organisms, and interacts with air temperature. And you might argue for ocean acidification coming under a very general ‘climate change’ too – though perhaps I’m thinking that because of carbon dioxide being linked to both. The increase in ocean heat content (OHC) is the main cause of sea level rise and although it has increased at the same time as global surface temperature (GST), it is not simply driven by GST. Both of these can be explained by various climate forcings (by people more expert than I am) but knowing GST alone does not determine OHC. How different climate forcings affect GST is more widely appreciated than how they affect OHC. . Important short term forcing agents are methane (from cattle, rice paddys) and black carbon (wood burning, diesel fumes). I’ve read stuff on the effects of these on GST but I would like to hear more (from people more expert than I am) about the effects on OHC. From what I’ve read short term agents affect OHC for a much longer time than they affect GST. (Because the temporary excess of heat cannot be radiated back into space so readily?) Does this mean there is more urgency in curtailing our consumption of beef, rice, fire wood and diesel fuel? by the whole earth. Most of it stored in the oceans and seas, some of it absorbed by the cryosphere and land masses, less of it in the atmosphere. The entire globe is warming, and the processes that induce weather use that increasing energy to increasingly warm the stratosphere, at times unpredictably, even chaotically. My understanding is that even if you can eliminate the accumulation of green house gases due to fossil energy burning and land use changes, the supply of extra energy in the oceans will be available to weather processes for many hundreds of years. Global warming is the cause, climate change is the effect, and so are biological change, terrestrial change, even societal change as we humans react to the effects of global warming. But, to me, “climate change” isn’t only expressed in physical variables like temperature. The field biologists, ecologists, and botanists report spontaneous changes in the migration timings and patterns of creatures and of plants, changes which are similar in direction and synchronicity, and changes which can only be explained by positing overall warming of Earth, and other manifestations of that, such as greater precipitation. These are signals, too, some quite powerful. Phenological shifts are amongst the first ecological signs of the biological impacts of climate change. There have been profound changes in phenology of countress species over the last few decades, and they presage worse to come. To me the key point is what is the best term to convey the problem to your audience. If I were talking to the people who post on this blog I would differentiate between Climate Change and Global Warming as Tamino has defined them. If I were talking to a general audience (like a group of High School students I used to teach) I would not bother to differentiate these terms. It is confusing to people who are not familiar with the science. I usually use climate change as it is a more general term and everyone now knows that the globe is warmer. Think about your audience. Repeat yourself on your main points. Michael, I agree – for non-technical folk the terms are interchangeable and the arguments about who calls it which and why are one more distraction in a thick soup of distractions. If someone calls it one rather than the other, I will usually reply using the term they used, without wasting time and effort disputing it. To me the fundamental process is the trapping of heat in the oceans and lower atmosphere. The symptoms include the warming of global average land and sea temperatures, more storms, more extreme weather events, sea level rise etc etc. 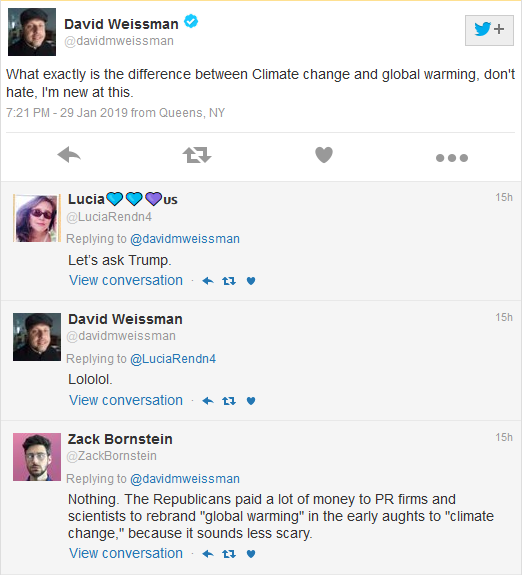 Both “global warming” and “climate change” are just convenient shorthand for the overall picture. The last answer in the list mentions a Republican strategy, I noticed that was in the movie ‘Vice’. I don’t know whether that actually happened but I guess it’s out there now, for better or for worse. Although a senior official at the EPA said that Cheney intervened to prevent mention of health effects of climate change in a report so it’s certainly plausible. Thanks Tamino, in the movie it’s presented as the outcome of responses to surveys, sounds like the movie got it right (with perhaps some dramatic license). I don’t think it matters what type of audience one is addressing. 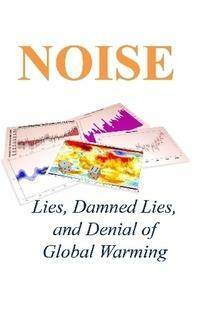 The simple fact is that global warming or global cooling, for whatever reason, causes the climate to change, period! I think if one explains the cooling or warming as the subtraction or addition of energy from the whole Earth system, then it should be understandable to anyone that the system as a whole will show the various changes that we’ve identified with climate change. These changes would include the warming or cooling of the troposphere and oceans, the changes in extreme weather caused by changes in the jet stream flow and intensity, the changes in the biosphere as organisms (including humans) try to adapt to different environments by migrating or changing their day to day behaviors, of even by going locally or regionally extinct. Of course, extreme warming or cooling, especially when caused by agents that bring rapid or abrupt warming or cooling (such as asteroid and comet impacts, long term super volcano eruptions, major geologic changes that suddenly release such gases as methane or sulfur dioxide, or even the rapid development of a global human civilization) can lead to mass extinction events which in themselves can lead to more climate change as global energy fluxes are disrupted and radically changed. Just because the actual changes that we perceive and experience can be very complex and even unexpected, it doesn’t mean the primary cause is complex. It’s actually very simple: more energy in or out, and the whole system changes, sometimes radically depending on how the energy flux changes. I think it is clear that “Global Warming” is the cause, “Climate Change” are the effects or symptoms of that relentless global temperature increase. This is like renaming “cancer” into “body organs change”, what is more effective, to address the root cause or the symptoms? “The scientific debate is closing [against us] but not yet closed. There is still a window of opportunity to challenge the science,” Mr Luntz writes in the memo, obtained by the Environmental Working Group, a Washington-based campaigning organisation. The phrase “global warming” should be abandoned in favour of “climate change”, Mr Luntz says, and the party should describe its policies as “conservationist” instead of “environmentalist”, because “most people” think environmentalists are “extremists” who indulge in “some pretty bizarre behaviour… that turns off many voters”. I’ve always thought of our CO2 output as the cause, global warming as the effect and climate change as the consequences.